The CDS-John Blue Flow Monitors are perfect for monitoring flow rates when spraying or applying agricultural liquid fertilizer. 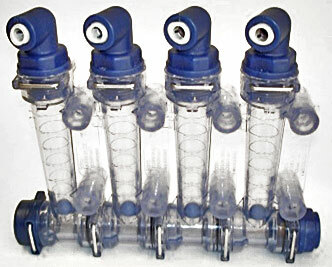 The VisaGage II is cost effective and simple to install in single columns or in sets of four flow meter assemblies. In addition, most CDS-John Blue Flow Monitor parts are interchangeable with other brands already on the market today. CDS-John Blue VisaGage II is manufactured with chemical resistant polypropylene adapters and clear PVC body with an additive for UV protection. Viton o-rings are also standard. There are no electronic parts that could potentially fail. * Add “-fum” after part number for fumigant models. **Most parts are interchangeable with Redball LLC© and Wilger Industries© equipment. SMPT-0009 – SMPT Ball Storage Unit – optional – holds up to 40 balls (use one per set of 8 bodies). Lid can be locked. SMPT-0014 – Tee (optional) for spray type use with typically 8 total bodies, 1″ NPT female inlet port and 1/4″ female NPT port for gauge. 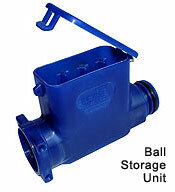 SMPT-0021 – 7/16″ Stainless Steel Ball (optional) for use with extra high flow rates. SMPT-0034 – #112 Viton O-ring (optional) used to seal orifice plates, install plate in recess of the 3/8″ NPT port adapters and then install the o-ring to retain and seal orifice plate. NEW SMPT-0049 – Flanged Tee – optional – for spray type use with typically 8 total bodies, 100 series flange with o-rings and 1/4″ female NPT port for gauge. NEW SMPT-0050 – Yellow Ball – optional – 13% heavier than the blue plastic ball and lighter than the glass ball that comes standard with the VisaGage II. NEW SMPT-0051 – 1/4″ Tube Push Connect Elbow Adapter, use existing VisaGage o-ring. NEW SMPT-0052 – 5/16″ Tube Push Connect Elbow Adapter, use existing VisaGage o-ring. NEW SMPT-0053 – 3/8″ Tube Push Connect Elbow Adapter, use existing VisaGage o-ring. SMPT-0061 – 1/2″ NPT End Cap Adapter. Uses magnetic sensing technology mounted behind the VisaGage II Flow Monitors. 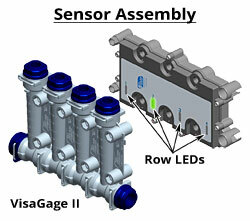 Sensors can be mounted to existing VisaGage II units; new magnetic balls are supplied with sensors. 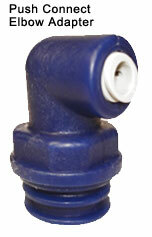 Identifies where magnetic balls are floating in each row during liquid application. Only LBMS shows both low-flow and no-flow. Plus, the Premium Wireless System also displays high flow for broken lines. Can be used with cloudy or dark liquids – LED is visible to the sides of the column. The alarm will reset automatically when the blockage has been corrected. Have the ability to “Pause” the system to capture problem rows for investigation later when you are able to stop. Our system is available in three user-friendly options: standard wired control panel, Apple iPad® wireless or the new Android® wireless system. New on the iPad and Android apps, sections can be defined and rows can be numbered. The LBMS App is free and available from either the Apple App Store or the Android Google Play Store. BMi-08 Premium System for iPad or Android systems. (Users are required to have their own iPad 2 or newer or an Android tablet 7” or larger). Premium 8 Row Kit includes: ram mounting bracket, input harness, 28 ft. extension harness, wireless sensor kit, standard sensor kit and two terminator plugs. BMPT-001 4-Row Sensor Expansion Kit for adding to BMi-08, BM-08AP and BM-08PL. Kit includes: standard sensor, tee harness, magnet balls and hardware. VisaGage II Flow Monitors are ordered separately: SMSS4 set of 4 Flow Monitor Spray Type and SMFD4 set of 4 Flow Monitor Divider Type. BMPT-001 – 4-Row Sensor Expansion Kit for adding to BMi-08, BM-08AP and BM-08PL. Kit includes: standard sensor, tee harness, magnet balls and hardware.